All good things, the old adage goes, must come to an end. And so it is with regret that we bid farewell to the residents of Whitechapel once more. After an episode packed with violence and darkness, it was an emotional but strangely hopeful goodbye. 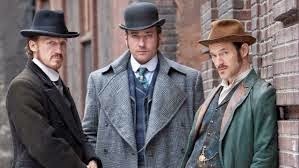 Despite Abberline’s efforts to force him into recuperation, Reid insisted he had business to finish before leaving police work and Leman Street behind for good. Fred Best, the East End’s most tenacious reporter, still pursuing the truth behind the train robbery that killed his friend, finally found answers in the form of New York journalist and whistle-blower, Ralph Ackerman. 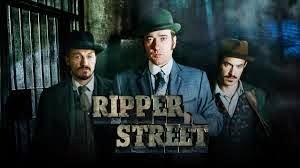 Ackerman passed information to Best regarding Theodore Swift’s web of corruption stateside, but soon found himself kidnapped and tortured by Swift’s men in some of the most brutal scenes in Ripper Street’s run. Ackerman was eventually killed, but not before giving up Best’s name. The unfortunate hacker’s body ended up on Jackson’s slab, and H Division’s investigation turned up a witness who saw Ackerman dining with Best shortly before his death. The constabulary set out to find Fred, but Jackson, having confirmed Susan’s fingerprints were on the gun that shot Reid, guessed the journalist had enough information to condemn his estranged wife and tracked him down first. He left Best hidden in his room with Mimi Morton keeping watch, while he set out to find the proof Ackerman claimed to have about Theodore’s criminal activities. Reid and Drake worked in parallel, finally tying the bearer bonds to Swift, and the theft of them and the resulting train crash to Susan. Reid found his own obituary in Best’s office, written while the inspector life hung in the balance, before proceeding to Susan’s house for answers. The ransacking of Susan’s private domicile, was nicely interspersed with gory scenes of Jackson dissecting Ackerman’s cadaver for the microfilm evidence of Swift’s arms dealing, twin examples of destruction and violation in the pursuit of answers. Jackson went to confront Susan, but before he could act on his discoveries, Susan confessed she was pregnant with his child. Returning home to find Best gone, and Mimi fully briefed on his past, Jackson and Ms. Morton parted ways, with Mimi sadly informing the captain that he had chosen his past over a future with her. Swift caught up with Best and in scenes which were incredibly difficult to watch, set about extracting information about who the journalist had told his secrets to. But realising he was as good as dead anyway, Best refused to talk, and he met his end with defiance and dignity, goading Swift into machine-gunning him down in front of a horrified Susan. Special mention must go to David Dawson for his outstanding performance in this episode, and for bringing complexity, depth and warmth to the character throughout the three seasons. Fred Best will be sorely missed and his last words will linger in my memory for a long time to come. By sacrificing himself, Best’s bullet-riddled body gave H Division the proof they needed of Swift’s involvement with the illicit weapons trade. Jackson confessed to Reid that Susan was the one who fired the gun at him, and whilst Susan set about turning her estate over to Amelia Frayn and Jane Cobden in preparation for fleeing London, Reid resolved to bring her to his cause. In an incredibly moving exchange, Reid told Susan that although she played her part in the train crash, the aftermath brought him back his daughter, and that he knew she always acted with the best of intentions. He posited that they were both simply caught in the jaws of fate, but that they might wrangle back some control by bringing down Swift. I loved the subtle allusion to the Victorian preoccupation with the sins of the father being visited on the children. Susan was desperate to believe she was not destined to live an evil life because of her parentage, and Reid was finally able to voice his regret that his obsession with the Ripper case almost destroyed his daughter. Some have commented that leaving Swift incarcerated in the basement where Mathilda was held was an unlawful act, and too macabre an act for men of justice to perpetrate, but I would argue that Swift’s punishment was largely symbolic. Susan, Reid, Drake, and Jackson burying the embodiment of evil in ‘the belly of Whitechapel’ served to bring the troubled chapters of their lives to a close. Theodore’s character was far less rounded than others. He was an archetypal villain, a blank page for the other characters to project their own demons onto. For Jackson he stood for a past he wanted to escape. For Susan, he represented the fact that she would always be at the mercy of men. For Drake, he was the latent rage he struggled with for so long. For Reid he was the relentless evil which drew his attention away from his child. Having seen what each of these characters is capable of, it was not a stretch for me to believe they would leave a man they believed to be truly, inherently bad to rot. By meting retribution rather than seeing justice done, the four left a reminder of the darkness which lurks in us all, just under the surface.With Swift defeated, Drake assumed Reid’s mantel as inspector, and finally married his true love, Rose. I must admit, I was waiting for something terrible to happen. I was convinced Ms. Erskine would be run down by a hansom cab on the way to the chapel or something, but they finally made it, and it warmed my black heart. Susan was not so fortunate, languishing in a jail cell, her fate uncertain, but with Jackson by her side. And Reid eventually made it to the coast with Mathilda. The closing scene of the two of them walking along the shore while Best’s voice read Edmund’s pre-emptive obituary was absolutely beautiful. As a piece of writing, and as his own epitaph, Fred Best’s tribute to a man who sought to make the world a fairer place moved me to tears. It was a fitting end to a staggering third series. I really hope we haven’t seen the last of Reid et al, but if we have, The Peace of Edmund Reid will stand as a fine goodbye to a superb drama. Excellent review and beautifully written.